Dubai, UAE., – Jun 4, 2014 – WD®, a Western Digital (NASDAQ: WDC) company, and world leader in storage solutions, demonstrated the first PCI Express hard drives at Computex Taipei, June 3-4, 2014.Enabled with key technology partners,WD’sprototypeintroduces the new SATA Express interface, a form of PCI Express technology,which is offered on recently launched Intel® series-9 chipset motherboard platforms. The SATA Express interface provides a roadmap for faster speeds, lower power consumption and increased flexibility for future OEM designs. The road to the world’s first demonstration of SATA Express has been in development for almost 3 years. In 2011, SATA-IO, the group responsible for charting the future of SATA, announced that it was developing a new specification that would fundamentally change the core technology behind SATA by melding it with the more advanced PCI Express computer interface. 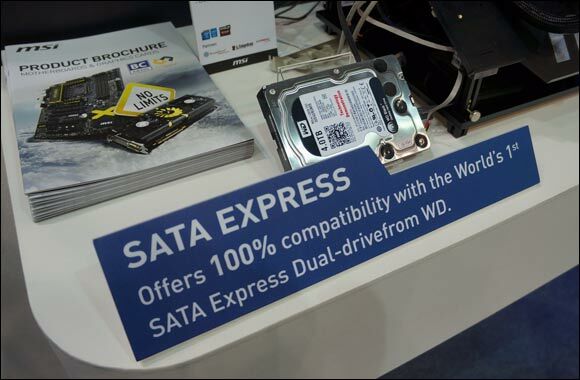 In 2013, the SATA Express specification was announced; and just one year later, WD and selected partners have realizeda prototype of what is expected to be the next generation of storage technology. By moving to PCI Express, the industry marries the world’s most popular storage bus with the world’s most popular computer bus. This union provides a solid growth path to innovate newcapability, while preserving the ability to plug legacy SATA drives into new SATA Express based computers. In another innovation, SATA Express allows cable connections with lower costs, by removing the PCI Express Sync line via SRIS (Separate RefClock with Independent SSC), which lowers the overall cable cost. The SATA Express interface was demonstrated in systems from WD’s key partners at Computexto show the operational interface with their new platforms. This new SATA Express infrastructure allows customers to work with SSDs, SSHDs, and HDDs on a single common bus. WD’s demonstration prototype leverages standard AHCI drivers and is compatible with all known, currently supported client operating system releases. “SATA Express is a breakthrough interface for internal storage. As a pioneer and leading provider of SATA Express host solutions, ASUS is glad to see exciting new devices demonstratedin the market. The SRIS-enabled SATA Express technology has been carefully engineered in selected ASUS 9 Series motherboards for great compatibility with SATA Express devices. The complete ASUS SATA Express solution together with the WD hard drive will be showcased at the ASUS booth M0810,” said Joe Hsieh, Corporate Vice President and General Manager of ASUS Motherboard Business Unit and Desktop Business Unit. This news release contains “forward-looking statements,” including statements relating to the estimated growth and adoptionof SATA, SATA Express and PCI Express, and WD’s ability to launch products which integrate such technologies. These forward-looking statements are subject to risks and uncertainties that could cause actual results to differ materially from those expressed in the forward-looking statements, including the viability and success of the SATA Express and PCI Expresstechnologies or, even if viable, that they will be profitable or accepted by the market; the possibility that advanced technologies may be developed or brought to market faster than WD; the failure to accurately anticipate customers' changing needs and emerging technological trends; the failure by certain suppliers to develop and manufacture components, technology or production equipment for our products; the success of such technologies and or other risks detailed from time-to-time in our Securities and Exchange Commission filings and reports, including, but not limited to, our most recent quarterly report on Form 10-Q and our annual report on Form 10-K, to which your attention is directed. Readers are cautioned not to place undue reliance on these forward-looking statements, which speak as of the date hereof, and WD undertakes no obligation to update these forward-looking statements to reflect subsequent events or circumstances.